How to contact Glenn Loney: Please email invitations and personal correspondences to Mr. Loney via Editor, New York Theatre Wire. Do not send faxes regarding such matters to The Everett Collection, which is only responsible for making Loney's INFOTOGRAPHY photo-images available for commercial and editorial uses. How to purchase rights to photos by Glenn Loney: For editorial and commercial uses of the Glenn Loney INFOTOGRAPHY/ArtsArchive of international photo-images, contact THE EVERETT COLLECTION, 104 West 27th Street, NYC 10010. Phone: 212-255-8610/FAX: 212-255-8612. For archival versions of Glenn Loney's past columns, please try our internal search engine. The opening days of the Bregenz Festival this past July were celebratory in the extreme. 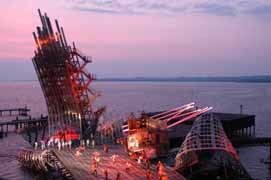 Not only was there a heart-breaking and remarkably imaginative new production of Leos Janacek's "Das schlau Füchslein" and a monumental revival of Leonard Bernstein's "West Side Story" on a giant purpose-built stage on Austria's section of Lake Constance. But there were also many well-deserved tributes to the departing Artistic Director of the Festival, Dr. Alfred Wopmann. Although the Bregenz Festival as a major Austrian summer attraction dates back to 1946-in the wake of the devastation of World War II-it really owes its present fame and form to the vision and innovations of Dr. Wopmann. He developed the concept of "Bregenzer Dramaturgie", or"Bregenz Dramaturgy". This could be visually or metaphorically compared to the three legs supporting the fabled seat of the Oracle of Delphi. Certainly some of the productions of the Wopmann Era have been oracular in forecasting new directions in Music-Theatre! One leg of this imaginary tripod-and certainly the best-known and most popular-is the cutting-edge opera & musical productions on the stunning & special Constance/Bodensee stages. Each of these productions runs for two summers, selling out to thousands of spectators from all over Europe and abroad. The second leg of this mythic tripos is the ingenious revival of unjustly forgotten or neglected operas: some from the mists of music-history, others from the recent past. These productions are mounted inside the festival-complex, on the proscenium-stage of the Festival Theatre. Each summer one such work receives a memorable production, but it is on view only for the all-too-short season. Fortunately, most of these stagings are co-productions with other noted opera companies in Amsterdam, Geneva, and even Houston and San Francisco! A third and more recent addition to the tripod is the introduction of innnovative works of Music-Theatre, staged in the spacious new Workshop Theatre of the festival-complex. And bracing these three legs is the complementary program of concerts. Not to overlook the German-language drama productions, often provided by Hamburg's prestigious and equally cutting-edge Thalia Theatre. He certainly has earned such a recognition from a grateful Austria. Frankly, as I have been attending the Bregenz and the Salzburg Festivals since 1956, I'm hoping I can survive through 2006, so I can claim fifty years of supporting major Austrian festivals not only with my attentive & appreciative presence, but also with my reviews, interviews, and reports of many remarkable productions of opera, musicals, and drama. Shouldn't this be worth at least a Kultur-Verdienst Kreuz Zweiter Klasse? [Joking aside, I've been doing the same for Germany's Bayreuth and Munich Opera Festivals for almost half a century. Initially, I bought my own tickets, as I had no clue about press-tickets. And only toward the end of my four years in Europe as a University of Maryland professor did I begin to report on these festivals for such publications as Theatre Arts, the New York Herald-Tribune, and the admirable Christian Science Monitor. I was seeing remarkably ingenious opera and drama productions that were not being reported or reviewed in major American newspapers and magazines. [Since I returned to the United States and a theatre professorship in New York City, I have returned to Europe every summer for the major-and some minor-festivals. I believe I am the only American theatre-critic who can make that claim. As Bregenz was saying a grateful , but slightly sad, good-bye to Alfred Wopmann, it was also preparing a welcoming Hello for his talented successor, David Pountney, who is already well-known on the Bodensee for his monumental opera-stagings. Notably a "Flying Dutchman" as a 19th Centuury Industrial Hell and a hauntingly Magritte-style "Fidelio." Pountney honed his directorial craft and his innovative vision at ENO, the English National Opera, and his unusual operatic visions are now to be seen on major international opera stages. His "Faust", for the Bavarian State Opera, is one of the most flamboyantly bizarre post-modernist stagings of this traditional Romantic opera. "Mephistophiles" ascends to Heaven in a wheelchair! Pountney's first season as the Festival's Artistic Director-or Intendant-in July 2004 will feature the second year of Leonard Bernstein's "West Side Story" on the lake-stage. But the opera indoors will be a double-bill of two forgotten Kurt Weill short operas: "Royal Palace" amd "Der Protagonist". The Protagonist-on a text by Georg Kaiser-is Weill's first opera, but Pountney sees both works as worthy complements to the Bernstein/Sondheim musical on Lake Constance. These innovative American talents he views as direct inheritors of Kurt Weill's and Bertolt Brecht's fusion of serious subjects with exciting music. There will be some important production changes,which will make possible more performances-and more seats-especially on weekends. As the festival-complex has evolved over recent years, the foyers of the indoor opera-house also have to serve the lake-stage production. Thus, it is impossible to have both shows playing at the same time. And, in the event of rain on the lake, that production has to be moved inside, with a reduced setting and audience. Recently, some disappointed would-be ticket-buyers have asked why the indoor opera productions could not be played in the afternoons, leaving evenings free for the show on the lake. Orchestral concerts of the Vienna Symphony-the "house" orchestra of the Bregenz Festival-have been programmed as matinees. In Europe, this means what it says: not afternoon performances, but morning concerts. Beginning in Summer 2004, it will be possible to have morning concerts, afternoon indoor operas, and evenings with "West Side Story" on the lake-stage. This will certainly increase the number of possible performances and seats to accommodate the larger weekend crowds. As the bleacher-seating of the lake-stage is now conformed-some 7,000 seats-it is impossible to add more rows of seats. But the Festival's far-sighted Technical Director, Gerd Alfons, believes it might be possible to construct special box or loge-seating on top of the control-booths, above the bleachers. It is also possible to re-conform the lobbies and foyers of the Festspielhaus, providing easier access to the theatres, as well as boutiques, cafes, and other amenities. Such architectural changes, of course, require not only municipal approval, but also funding from the City of Bregenz, the Land of Voraarlberg, and possibly even the Federal Government in Vienna. Considering what a tourist-magnet the Festival has become-not overlooking its watershed effect as a fountain of cultural innovation-these changes and expenditures seem a practical investment in the future. The Festival in recent years has put Bregenz "on the map" in a major way. And the Trickle-down Effect of the money spent on productions, talent, and tourism would be even greater than the millions now earned every season. Euro, only 5.5 Million of these are city, state, and federal subsidies. There is also production support from major corporations such as Nestlé. All the rest is earned at the box-office! For some time now, the signature of the Festival programming has been Dr. Wopmann's imposing phrase: "Bregenz Dramaturgy". But it may be that David Pountney has decreed a more accessible phrase for opera and theatre-lovers who have no idea what is meant by Dramaturgy. The new and colorful promotional videotape of the Bregenz Festival-which shows snippets of memorable stagings, including Pountney's "Dutchman" and "Fidelio"-now uses the catch-word of "The Bregenz Concept"! San Francisco Opera & Bregenz Festival join hands in brilliant co-production:Leos Janacek's "Cunning Little Vixen"
the wings, as Gerd Alfons showed how the settings looked from backstage. I prepared to photograph this odd set-piece, but he asked me not to do that, as it might be used when the production moved to the California Bay City. From more than three decades of reporting on theatre, dance, and opera concepts, designs, and technical solutions for "Theatre crafts"-now called "Entertainment Design"-my first interest as a reporter or reviewer is not how they sang, but how-and why-the new production was conceived as it was. And how this vision was achieved on stage. Not so long ago, the unusually visionary operas of Leos Janacek were seldom produced. Even now "The Excursions of Herr Broucek" and "Aus einem Totenhaus" are very seldom staged. But such works as "The Makropulous Case," Jenufa"," Katya Kabanova", and "Das schlaue Füchslein" have found their rightful places in the repertories of leading opera-houses. Thus it was a surprise that Dr. Wopmann chose "Füchslein" as his final indoor production at the Festival. Today, it is hardly forgotten or neglected. It was once neglected, true, but largely because it was regarded as almost impossible to visualize on stage. Imaginative productions at the Glyndebourne Festival and ENO-among others-demonstrated that it could be performed quite simply, especially by enlisting the imaginations of the spectators. But Janacek's "Füchslein" has a male mate for its "Cunning Little Vixen", not to forget her little foxes and a host of woodland creatures, including insects. Younger singers with reputations to make were glad of the opportunity to show what they could do in such roles. Opera choristers were hardly in a position to complain, and opera ballets rose to the movement challenges with gusto. The result has been a number of magical productions, including Maurice Sendak's "Cartoons-as-High-Art" vision of woodland and village settings and fantastical costumes. Munich's current "Füchslein" production concentrates the fantasy on the costumes, rather than the setting, which is essentially several clumps of step-ladders on an otherwise bare stage. Director Daniel Slater and his designer, Robert Innes-Hopkins, have taken quite a different approach, distinctly innovative, yet ultimately revelatory of the deeper emotions of both humans and animals in this strange fable, obviously so close to Janacek's secret heart. Slater notes that when they were beginning discussions at the cocktail-hour, a drinker nearby overheard and told them he knew the opera was about some people who turned into animals. Of course that is not at all what happens, but this odd misunderstanding gave them a brilliant idea for visualizing "Füchslein" anew. The Forester-despite being a married man-is obviously deeply lonely, disappointed in life, and discouraged about the future. Finding the cute little vixen, saving its life, and bringing it home with him means much more than a man who needs a pet or another mouth to feed. His special affection for the vixen has nothing of vulgar bestial perversion about it: there is nothing in the text or music to suggest that. But his bond with the little fox is certainly some kind of love. 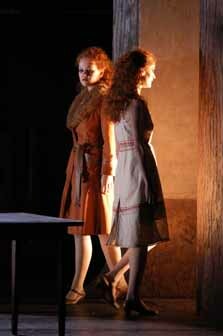 Although soporano Margareta Klobucar can wear a fox-suit and cavort with athletic glee as Füchsin Schlaukopf on other opera stages, in the Bregenz/San Francisco production, she plays a beautiful young red-haired girl who dons a coat with a huge fox-fur collar, which effectively suggests both the vixen and the female essence. So the bar-fly's chance remark inspired the idea of metaphoric transformations worthy of Ovid. In case anyone in the audience misses the sense of love and longing, there is a dancing duo, standing in for the vixen and the Forester, strongly sung and acted by Peter Coleman-Wright. As for creating a Czech woodland wonderland, the team went the opposite direction from Sendak or the Romantic Realists. Instead, the forest was simply suggested by a few chairs or a table from the village pub standing in solitary silhouette upstage on one of the Art Nouveau sliding scenic-sections. This was amazingly effective-even haunting. Innes-Hopkins' sliding sections were a series of ten rounded rectangular frames which could roll stage-right or stage-left to change the central stage-picture. These were three-dimensional, so the raised floors of the frame-bottoms were playable. Actually, the frame fartherest upstage had a round opening, so it looked like the end of a tunnel, when all ten were lined-up at the close. The only apparent divergence from this basic scenic-scheme was the hilarious fox in the hen-house scene, in which the mischievous vixen inspires the assembly-line egg-laying hens to rebel against the arrogant tyranny of the rooster. The animals, fowls, and insects, on the other, hand, inevitably obey the laws of Nature, the changes of the seasons, and the inevitable birth-death-birth cycles of renewal. Even though audiences may glimpse some elements of human behavior, they are not people, and they inhabit a different but parallel world. Aletta Collins devised the ingenious choreographies. And the magisterial Vladimir Fedoseyev conducted the Wiener Symphoniker with great sensitivity. San Francisco Opera regulars have a great treat in store! Leonard Bernstein's "West Side Story" on Lake Constance instead of the Hudson River! Is it mere coincidence that the two Music-Theatre composers featured this past summer at the Bregenz Festival both have Leonine first-names? Leos and Leonard! Although West Side Story premiered on Broadway in 1957-which makes this seminal musical almost half-a-century old-it has been revived on the Bodensee as a contemporary vision of Outsiders versus Insiders. Even though both youth gangs, the "Jets" and the "Sharks", are both Outsiders. With the Whites less Outside than the Puerto Ricans. Given the current nature of gangs and turf-wars in modern Manhattan, this is really archivally quaint. monumental skyscraper Leaning Tower of steel and glass. He has noted this as a visible contrast of dominant Capitalism to the poverty and misery of Manhattan's slums. Actually, this Post-Modernist megalith looks more like a 9/11 homage to the twisted ruins of the World Trade Center Twin Towers. It belongs to an entirely different musical or opera, which has yet to be written. But architectural monumentality is often a signature of a Tsypin stage-design-at least when the producers can afford it. His virtually inaccessible and almost unplayable scaffoldings for the Peter Sellars Salzburg Festival production of Olivier Messeian's St. Francis of Assisi was a similar structural folly. If both designer Tyspin and stage-director Francesca Zambello-who should know better-really believe West Side Story is about the contrasts between Insider Capitalism and Outsider Poverty and Discrimination, they should take a closer look at the actual book and lyrics, not to overlook Shakespeare's "Romeo & Juliet" which inspired it. Evil agents of Capitalism-who might be seen as the creators of the Economic System that forces White and Hispanic kids to band into opposing street-gangs-are nowhere to be found in Arthur Laurents' elemental book, although something of the sort is suggested now and then in Stephen Sondheim's clever lyrics. For that matter, the crux of the Lovers' Problem in "Romeo and Juliet" is the mutual hatred of the two families, the Montagues and Capulets. Both of which are Italian Renaissance Capitalists. In West Side Story, the essential conflict is between the more mainstream white gang versus the obvious outsider Puerto Rican gang. The parents on both sides who have engendered their hates, fears, and prejudices are nowhere to be seen on stage. So attempting to impose a much larger, weightier oppressive social structure onto this story of doomed love is more than it can bear. Nor is "West Side Story" any longer effectively contemporary. In Manhattan today, it would be almost impossible to find an all-White street-gang. Working-class Whites have virtually abandoned the Metropolis for the Outer Boroughs. And, while there are strong enmities among Black and Latino groups, the turf-wars are more often about drug-dealing than about who's seeing my sister. This is what makes "West Side Story" now seem so archivally quaint, despite its musical and lyrical charms. If a more up-to-date treatment is needed, there's always Paul Simon's Latino "Capeman", which was an abrupt flop on Broadway. Making the keynote-address in the opening ceremonies, Leonard Bernstein's daughter Jamie Bernstein Thomas revealed something even more astonishing about the gestation of the musical. She said: "Director Jerome Robbins' original concept was not about "Jets" and "Sharks" at all; he first wanted the Capulets to be Jews and the Montagues to be Catholics, with their strong feelings reaching a crisis point during the Easter and Passover Holidays." If this is true, it's small wonder that Bernstein put the suggestion aside for five years. It also shows how out-of-touch Robbins may have been with the underside of Manhattan life--aside from encounters with hustlers. While there certainly were Jewish gangsters in the 1920s, 30s, and 40s, the idea of Jewish teen-age street-gangs seems strange. For the same reason there are said to be no teen-age Jewish homosexuals: "Their mothers won't let them!" Kids from slums on the Lower East Side were trying to get out of the ghetto via education. Both Laurents and Sondheim have told me-and my graduate students in Musical Theatre-that the initial idea was a confrontation between Puerto Rican and Black teen-gangs. But the issue of miscegenation was still too risk for a Broadway musical in the late 1950s. As for the stark contrasts of overwhelming skyscrapers dwarfing and stunting the lives of West Side slum-kids, the actual site of "West Side Story" is now Lincoln Center, which was not then-and hardly now-engulfed by skyscrapers. A far more powerful contrast between extreme wealth and dire poverty engendering youth gangs was to be found during the Depression Era on the East Side, right on the East River-not on the Hudson. This was the site of Sydney Kingsley's "Dead End", with the "Dead End" Kids becoming movie-favorites. At that time, luxury skyscrapers rose beside stinking slaughter-houses. Where once cows and sheep were butchered, now stands the United Nations, presiding over international butcheries of a quite different nature. So "West Side Story" is hardly a contemporary paradigm. It's not even relevant in a drug-ridden social underside. But it is an affecting Period Musical remembering a much more innocent time in America. But, for an immense musical spectacle on Lake Constance, "West Side Story" has the same scenic limitations as most of the operas that have been given gargantuan productions on the lake-stage. Almost all of the scenes are relatively intimate, with only gang-rumbles offering the possibility of full-stage choreographic extravaganzas. The same problem was posed for Bregenz by "A Masked Ball", "Fidelio", and "Flying Dutchman". Indeed, it is difficult to imagine an effective opera composed of nothing but full-cast, full-stage spectacular scenes. Designer George Tsypin, in creating the "West Side Story" Leaning Tower, has provided the Festival with the structural equivalent of "Masked Ball"'s towering human skeleton, visible kilometers distant and reproduced in media worldwide. But for some of the intimate scenes, he has provided a drug-store-front that scoots from beside the skyscraper down to mid-stage like a streetcar. Other small-scale scenes are accommodated in the revolving Brick House, which also can move forward on tracks. Because it has to contain several interiors, the effect of most of these often crucial scenes is somewhat cramped. And how were the performances, after all this technical/conceptual concern? Not bad at all. Maria Montalvo, in fact, was radiant as Maria, and Sibylle Wolf was amusing and charming as Anita. Andreas Wolfram was scary as Bernardo, but Jesper Tydén's Tony seemed vocally and physically a bit wan, though handsome. Can you believe the slum-kids' chorus was the Kammerchor Moskau? Wayne Marshall conducted the Wiener Symphoniker with appropriate Broadway flair. Richard Wherlock's choreography was rather routine for what should have been a revelation. Marie Jeanne Lecca's costumes were adequate, without being outstanding, but then these kids live in the slums, OK? Fortunately, James F. Ingalls' lighting made sets, costumes, and dance-routines look even better than they actually were. For those who love figures, the skyscraper-Wolkenkratzer, in German-is 36 meters high. And it will stand there in place all winter, waiting for next July's audiences. It leans forward at a 60° angle. Grounded on 13 steel and five wooden piles, it weighs 160 tons! The foundations in the lake required 34 tons of steel. Atop the skyscraper are 26 glass-towers which represent Manhattan and "the Hope for a newer, better Life." These weigh some 19 tons! The drugstore façade weighs twelve tons, while the Brick House is constructed of twelve tons of steel and ten tons of wood. And how about 95 loudspeakers and 800 spotlights? Copyright © Glenn Loney 2003. No re-publication or broadcast use without proper credit of authorship. Suggested credit line: "Glenn Loney, New York Theatre Wire." Reproduction rights please contact: jslaff@nytheatre-wire.com.